Being with Jessica has many advantages. One of these is eating with her folks. Her mom is a wonderful foodie who unlike some traditional Chinese people, is willing to try all cuisines. I was particularly happy when she was quick to recommend the hot dog-bread snack available throughout Europe on our trip last year. Her dad, while not a foodie, has a phenomenal working knowledge of Chinese history and has great tales. 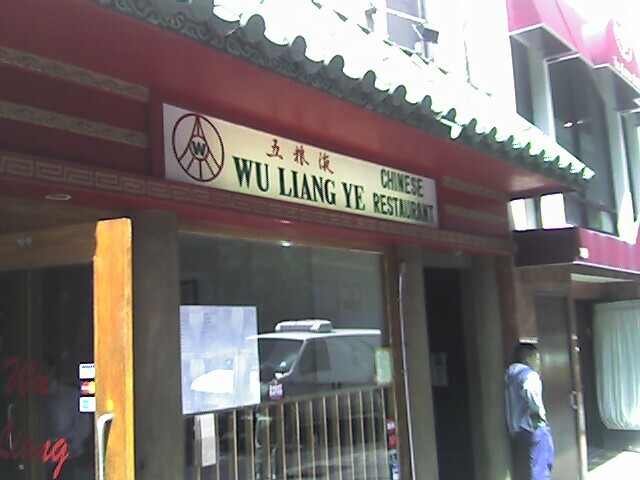 So while I’ve always been able to tell which Chinese restaurants taste good, only now do I know which are authentic. And so, enter Wu Liang Ye. I’m speaking about the one on the west side of Lexington Avenue between 49th & 50th Streets. I have to be specific because I don’t believe they’re associated with the one 86th street, or the one on 48th &5th that’s rated by Zagats, and I honestly doubt they have anything to do with the liquor. (Update 5/2/09 – they now say they are a chain?) Anyway, they’re an authentic Szechuan restaurant: us non-Chinese folk can tell their authenticity by the crowd that eats there and that they’re Szechuan by the amount of chili oil used in every dish! The first time I went was with Jessica and her family. We tried many dishes including two of my favorites the hong yo swa jao (Dumplings in Chili Oil Vinaigrette) and the Dan Dan Noodles. (fresh noodles with minced pork chili vinaigrette. I was also thrilled to see that they serve Camphor Tea Smoked Duck, which is one of my favorite Chinese dishes; although honestly, theirs is nothing special– but if you’ve never tried it, give it a shot. We had at least four other dishes including steamed whole fish with ginger and scallions, and we really enjoyed ourselves. Today I went back with Steve for lunch. It was crowded, but not overly packed. We passed over the highly Americanized lunch price fix menu and ordered those dumplings I mentioned and then shared an entree, the Sauteed Beef Filets with String Beans. I love how when they serve the dumplings they stir in some fresh garlic cream. The beef is served with a brown sauce that is perfectly salty and sweet, over the slightly too-oily string beans. The beef is sauteed to rare in cornstarch to thicken it. It was about $20 with tax & tip for lunch, what a steal for some great Chinese in midtown. posted by Lon	at 06:01 PM	Filed under Asian, Restaurants. You can follow any responses to this entry through the RSS 2.0 feed. Both comments and pings are currently closed.